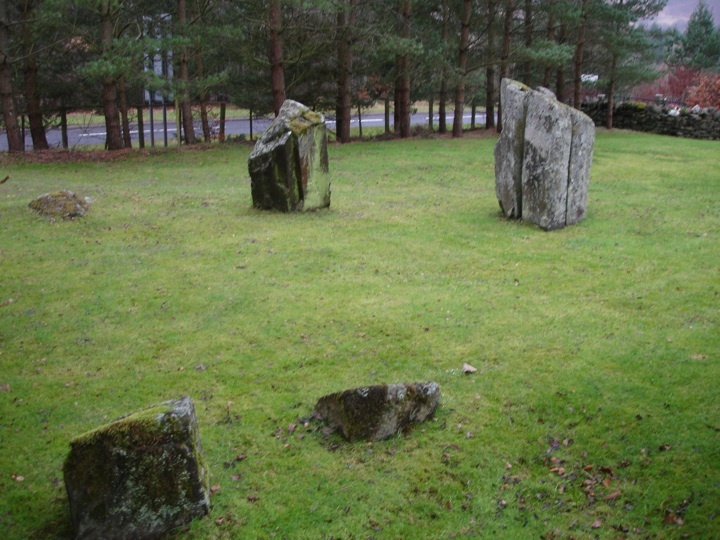 This stone circle sits in a garden beside some holiday cottages and is well looked after by their owners. Around 6.40m in diameter, the circle consists of seven stones, although there were probably a further two to the NE and SW originally. Five of the stones are small and low, and that to the W is almost buried. But two of the stones are much larger than the others, the largest a square block 1.63m tall that has been split by a lightning strike. Faskally Cottages is in the parish of Moulin and the county of Perthshire. Published on the 14th of May 2010 at 4:20 pm. Updated on the 31st of March 2011 at 7:25 am.